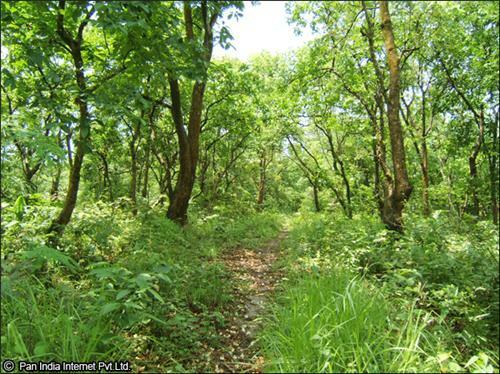 Thiruvananthapuram region has a reserve forest area of 495.1 km2 and vested plantation forest of 3.534 km2. The forests are spread over three ranges: the Kulathupuzha in the north, Palode in the middle, and the Paruthipalli ranges in the south. These forests may be amply classified into three classes, namely, Southern tropical and semi-evergreen forests, Southern tropical wet evergreen forests and Southern tropical moist deciduous forests. Social forestry programs are being implemented under the World Bank-aided Kerala Social Forestry Project, National Rural Employment Program (NREP) and Rural Fuel Wood Schemes to assist small scale and marginal farmers. Forest Department is one of the few oldest and important administrative body parts of the State with its head office at Thiruvananthapuram. Kerala Forest Department like other state departments in the country, has evolved over last one and half years in response to alterations in Forest Policy, main concerns in five year plans and demands on the forests. Major responsibilities allotted to the department are Biodiversity Conservation, Forest protection, Wildlife Management and research, plantation Development, Forest Vigilance and Evaluation, Social Forestry, Eco-development and Tribal Welfare, Planning and Research, Tribal Rehabilitation and Special Afforestation, FMIS, Infrastructure and Human Resource Development, General Administration encompassing Recruitment and Establishment matters. Thenmala, Agastyarkoodam peak and Peppara wildlife sanctuary are the major forest ranges in Thiruvananthapuram. Thenmala is located in Thiruvananthapuram on Shenkottai Road. It is situated 1,640 ft above the sea level. Thenmala is well known for the honey which had several medicinal properties. It is the first planned ecotourism project in India. Agastyarkoodam peak which is located in Thiruvananthapuram region is the second largest peak in Kerala. Peppara wildlife sanctuary is on the Western Ghats in Nedumangad Taluk. This sanctuary includes part of Palode and Kottoor Reserve forests. Some of the main peaks of this sanctuary include Athirumalai, Chemmunjimottai and Arumukhamkunnu. The forest ranges in this sanctuary encompass tropical evergreen, moist mixed deciduous forests and semi-evergreen. The Kerala Forest department is ruled by Chief Conservator of forest. The primary Chief Conservator of forest is assisted by additional Chief Conservator of Forests, Chief Conservator of forests (Development), Chief Conservator of forest (Wildlife), Chief Conservator of forests (Protection), Chief Conservator of forests (FMIS), Chief Conservator of forests (Vigilance), Chief Conservator of forest (IHRD), Chief Conservator of forests (Administration), Chief Conservators of forests (Social Forestry), Chief Conservator of forests (Eco-Development & Tribal Welfare), Chief Conservator of forests (Working Plan and research) and two local additional Chief Conservators one at Kollam and one at Kozhikode. For general administration there are forest rounds leading by Chief Conservators of Forests, under their jurisdiction Forest Divisions are controlled by Divisional Forest Officers. Each division is further sub split up into Forest Ranges manned by Forest Rangers describing to the Divisional Forest Officers.